SANTA CLARITA, CA--(Marketwired - Jan 24, 2017) - Impressive sales and continued homebuyer demand has prompted a brand-new phase release at Christopher Homes' Monterra neighborhood at Five Knolls. This stunning single-family collection is Santa Clarita's must-see address with superbly crafted home designs; spacious, open floorplans; exquisite detailing; and desirable indoor/outdoor living spaces. The setting within the master-planned community of Five Knolls heightens the appeal even more, offering homeowners a robust lifestyle with beautiful parks, meandering trails and vibrant recreation the whole family will enjoy. Those interested in Monterra should come to the Sales Office today to take advantage of these fresh phase opportunities. "Monterra is the best value the area has to offer and it's thrilling to see that homebuyers agree," said Jaime Todd, Vice President of Sales and Marketing for Christopher Homes. "Visit soon to take advantage of the best home selection in this new phase as well as a limited number of quick move-in opportunities." 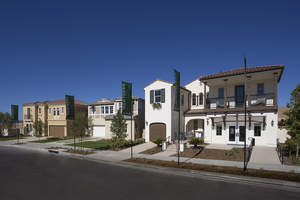 For more information on Monterra at Five Knolls, go to www.christopher-homes.com. Monterra offers three innovative new-home designs ranging from approximately 3,583 to 3,858 square feet with 5 to 7 bedrooms plus bonus room, 4 to 6 baths plus powder room and 2- to 3-car garages. Design highlights include gourmet kitchens with oversized islands, granite slab countertops, large walk-in pantries and KitchenAid® stainless steel appliances; California Rooms included in Residences 2 and 3; bonus rooms; and a separate dining room in Residence 3. Prices start from the high $600,000s. Set in Santa Clarita, one of the safest cities in California, Monterra homeowners enjoy an outstanding quality of life with great restaurants, retail and recreation all close to home. Commuters will find the Metrolink and Metro Orange and Red lines nearby, plus easy access to I-5 and I-14. Elementary school-aged residents attend two elementary schools in the Saugus Union School District, while older children have access to William S. Hart Union High School District's La Mesa Junior High School and Golden Valley High School. Five Knolls in Santa Clarita offers a refreshing new lifestyle with six stylish new neighborhoods and a mix of community amenities, creating the ultimate invitation to explore. The great outdoors is just outside the front door, from the array of trails to the five signature knolls the community is named for. Golden Valley Park brings a mixture of open spaces and gathering places as well as picnic enclaves, a shaded playground, basketball half-court and big and small dog park. The Club is a haven for all things fun, where residents can splash around in the pool, relax in the spa or meet up with friends. The everyday destinations are within moments of home thanks to the Golden Valley Road extension. For more details on the new community of Five Knolls, please visit the website at FiveKnolls.com. To visit Monterra from I-5 North, take CA-14 north and exit Golden Valley Road. Golden Valley Road turns into Newhall Ranch Road. Continue on Newhall Ranch Road and turn right on Golden Valley Road. Stay on Golden Valley Road and turn left on Claremore Way. To visit from I-5 South, exit Newhall Ranch Road. Continue on Newhall Ranch Road and turn left on Golden Valley Road then left on Claremore Way. Follow signs to models. The sales office is open Monday from 1 p.m. to 5 p.m. and Tuesday to Sunday from 10 a.m. to 5 p.m. For more information, call 661.673.5359 or visit www.christopher-homes.com. Those interested are also encouraged to follow Christopher Homes on Facebook, Instagram and YouTube. Discover three impressively sized, single-family home designs that showcase spacious interiors, fine detailing and a host of modern amenities at Monterra in Santa Clarita.